Due to the lack of an Easter programme in the Premier League, we only had one game this weekend, so I felt oddly cheated but determined to make the most of the one that we had. The sun was shining when I reached the West Herts and joined the usual suspects at ‘our’ table. Mike and Toddy were slumming with us before taking their place in the posh seats as a result of winning the Supporters Trust draw. The rest of us enjoyed our more modest surroundings as much as we always do. Discussion pre-match was about whether the next two games were must wins. I must admit that, looking at the table with only 7 games to go, Watford’s 37 points and 10th place was starting to convince me that safety had already been achieved and so maybe we wouldn’t need any further points. But it would be very reassuring to reach the holy grail of 40 points and this game had to be our best chance to do so. The visit of Swansea also meant a return to Vicarage Road for legend and all round good egg Nigel Gibbs, who is on their coaching staff. So it was a nice touch when Tim Coombs prefaced his reading of the away team with a welcome back for Gibbsy and the crowd gave him a very warm welcome indeed. Team news was that Deeney was restored to the starting line-up alongside Prödl and Capoue replacing Okaka, Cathcart and Success. So the starting line-up was Gomes; Janmaat, Prödl, Mariappa, Holebas; Cleverley, Doucouré, Capoue; Amrabat, Deeney and Niang. The first goalmouth action of the game was a cross from Amrabat that was headed clear by Mawson. The first actual goal attempt fell to the visitors as Sigurdsson broke into the box, his first shot was blocked, his second required a decent save from Gomes at the near post. Swansea fashioned another dangerous chance as Sigurdsson launched a free kick into the box, the punch from Gomes flew into the air and fell for Fernández whose header, thankfully, landed on the roof of the net. 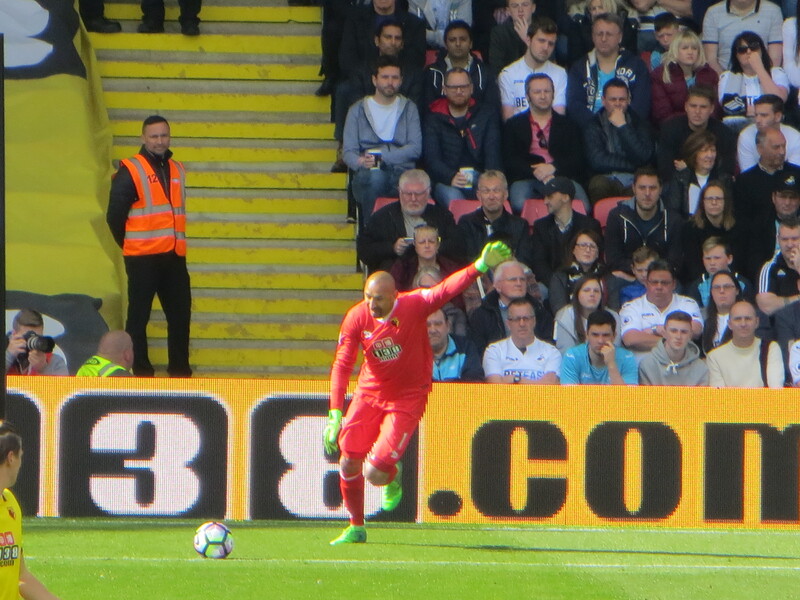 Watford’s first attempt on target came as Niang went on a run and tried a low shot from distance, but it was easy for Fabianski in the Swansea goal. 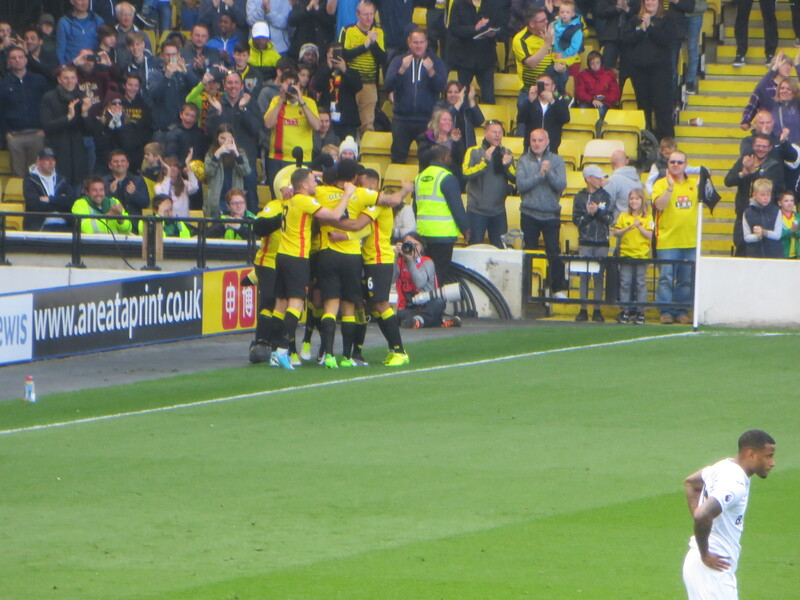 A lovely passing move from the Hornets finished with Amrabat shooting wide of the far post. 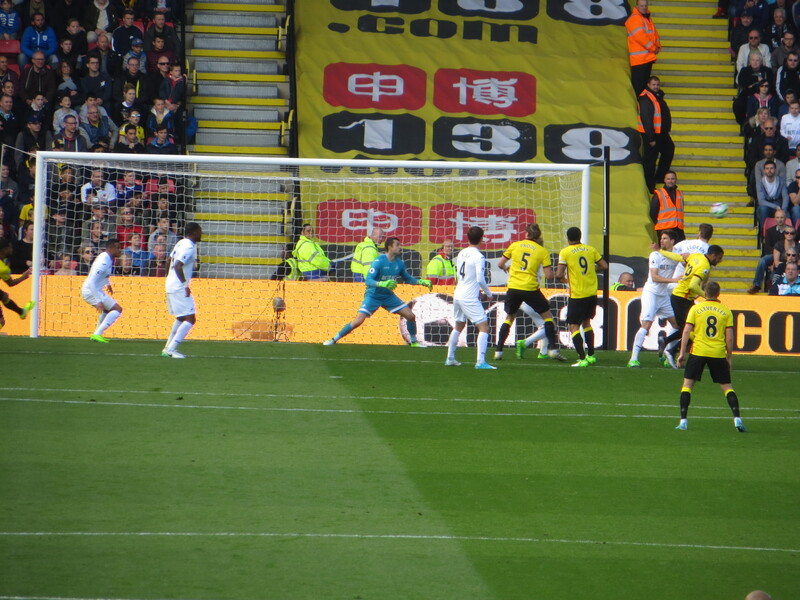 The Hornets had a great chance to open the scoring as Capoue played a lovely through ball towards Deeney in the box, but Fabianski was first to the ball. There was good work from Doucouré to nick the ball before releasing Niang who was fouled on the edge of the area. The Frenchman took the set piece himself, shooting through the wall but Fabianski dropped to make the save. Then Janmaat won the ball and went on a tremendous run before crossing for Deeney whose shot was tipped over by Fabianski. Despite the dominance of the Hornets, the visitors should have taken the lead on the half hour as Narsingh found Ki Sung-Yueng who only had Gomes to beat from close range, but he hesitated and then, as a defender appeared, shot straight at Gomes. Sigurdsson was the next to try his luck, but his shot from distance was easy for Gomes. Just when it looked as though the game would reach half time goalless, Capoue nicked the ball from Mawson and broke into the box, his first shot was blocked, but he buried the rebound to send the Rookery and particularly my niece, his biggest fan, into raptures. So the Hornets were leading at the break. They had dominated possession without threatening Fabianski’s goal on too many occasions. Swansea had a few decent chances, but they were clearly bereft of confidence and looked very unlikely to get back into the game. The half time draw was made by Kenny Jackett. As always it was lovely to see him back at Vicarage Road and he said all the right things when asked what he wanted from the meeting of two of his former clubs. As the players came out for the start of the second half, instead of taking his place in goal in front of the Rookery, Fabianski remained on the half-way line. I thought we were in for a very unusual kick-off but it turned out that he was just waiting for the referee to reappear with the matchball, so that he could have a cuddle of the ball before continuing. There was an early second half chance for the visitors as Sigurdsson tried a shot from just outside the area that flew wide. At the other end Doucouré had a sight of goal so hit a shot from distance that flew over the bar. Then Janmaat went on a great run into the box and unleashed a powerful shot that Fabianski did very well to divert from its intended path to the top corner. 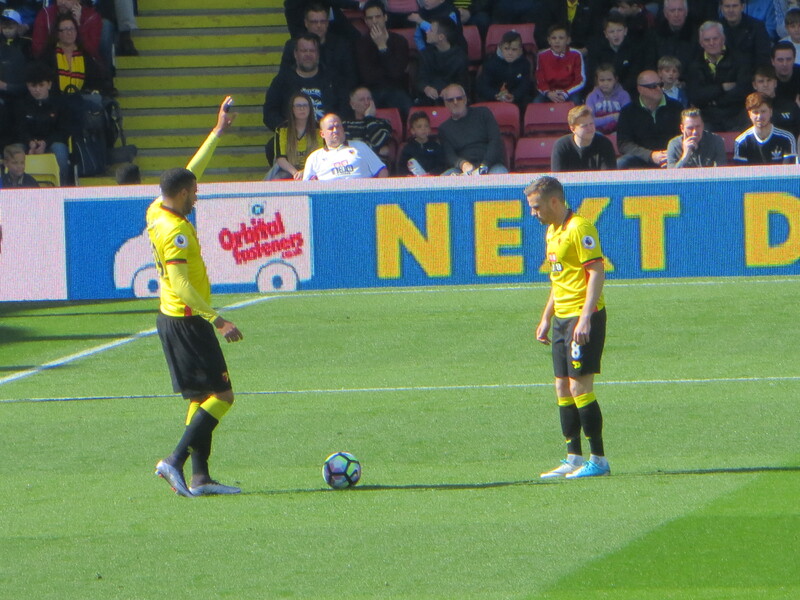 Watford’s first substitution came just after the hour mark when Amrabat, who was waiting to take a throw-in on the opposite side from the dugouts, was replaced by Kabasele. Nordin looked furious as he walked the width of the pitch and the message from Mazzarri was that his aim was to preserve the lead, a tactic that hasn’t always worked for us. The 72nd minute was greeted with the customary chant of “One Graham Taylor” and the picture on the big screen showed Rita with her granddaughter in the Directors’ box. So lovely to see her at Vicarage Road and I hope that the continued expressions of love for Graham bring her some comfort. Mazzarri’s second substitution saw Okaka replacing Niang. The Italian looked to have sealed the game for the Hornets soon after when he received a lovely cross from Janmaat, controlled the ball on his chest and volleyed past Fabianski. Sadly the goal was ruled out for offside. 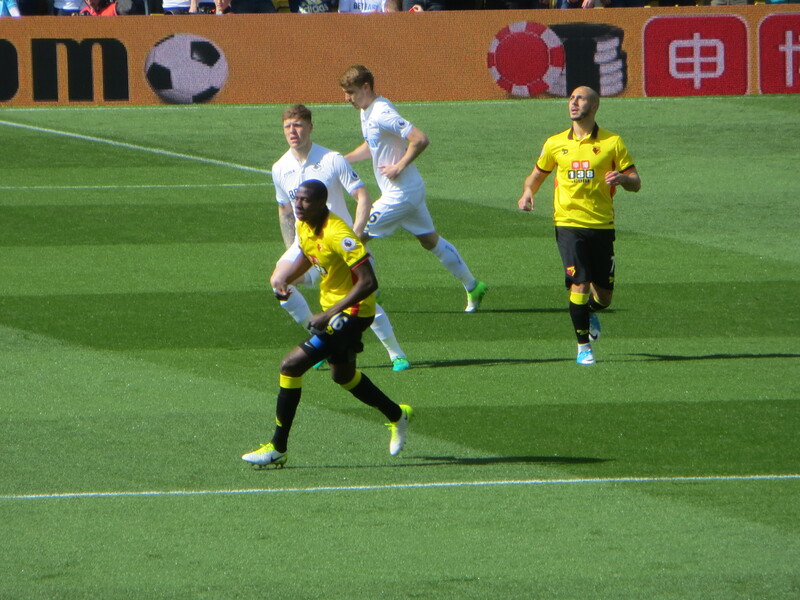 Okaka turned provider soon after, crossing for Capoue whose shot cleared the bar. There was danger for the home side as Sigurdsson swung a free kick towards goal, but Gomes was able to punch clear. Then Ayew broke forward and crossed for Carroll whose shot found the side netting. Mazzarri’s final change was to bring Behrami on in place of Cleverley. Watford had one last chance to ensure the win as Doucouré tried a shot from outside the area, but Fabianski was equal to it. The visitors had two chances to retrieve a point in time added on. First a mistake from Prödl allowed them to advance, Borja crossed for Sigurdsson whose header was poor and flew wide of the near post. The Icelander had one last chance, going on a dangerous run that was stopped by a crucial tackle from Doucouré. So the final whistle went on the third home win in a row with the Hornets sitting pretty in 10th place having amassed 40 points. 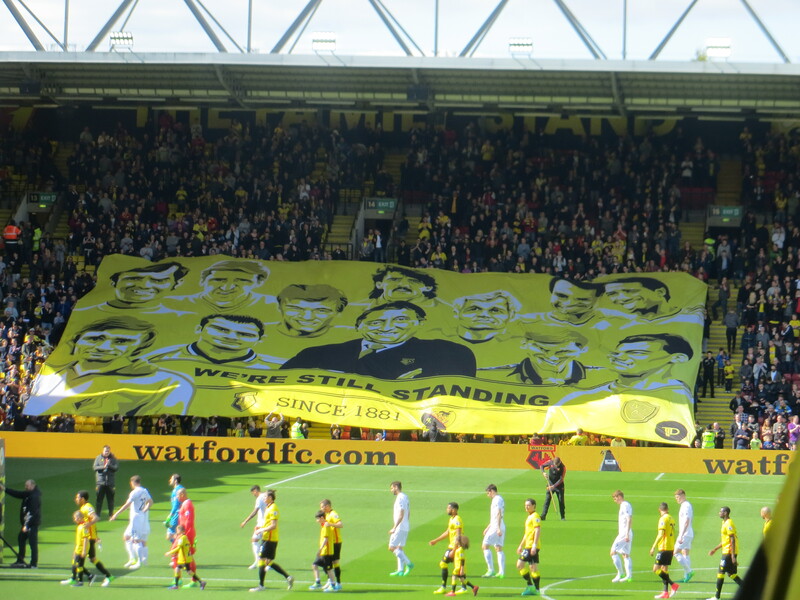 The second half had been a poor spectacle and, with only the one goal lead, they seemed to make heavy weather of the game, but the three points has all but guaranteed that Watford will be a Premier League club for the third season in a row so the crowds leaving Vicarage Road did so with a spring in their step and those of us who had secured our season tickets for next season were feeling very happy indeed. This entry was posted in Watford FC and tagged Abdoulaye Doucoure, Adrian Mariappa, Alfie Mawson, Christian Kabasele, Daryl Janmaat, Etienne Capoue, Fernando Llorente, Frederico Fernandez, Gonzalez Borja Baston, Gylfi Sigurdsson, Heurelho Gomes, Jay Fulton, Jordan Ayew, Jose Holebas, Ki Sung-Yueng, Kyle Naughton, Leroy Fer, Luciano Narsingh, Lukasz Fabianski, M'Baye Niang, Martin Olsson, Nordin Amrabat, Paul Clement, Sebastian Prodl, Stefano Okaka, Swansea City FC, Tom Carroll, Tom Cleverley, Troy Deeney, Valon Behrami, Walter Mazzarri, Watford FC on April 16, 2017 by franelynn. Excellent, realistic and fair, thank you Frances.